Yvette starts with a look at the roots of Hardanger embroidery and its use on the traditional Norwegian costume, or bunad. There are lots of photos, including some good close-up shots of pieces in Norwegian museums. I can spend many happy hours poring over pictures like these. The introduction packs in a surprising amount of information and history while still leaving rooms for some glorious photos of the Hardanger region, with its fjord, mountains and neat houses. From here we move on to the technicalities of materials, threads, working methods and the differences between the original form of the embroidery and the modified versions of Hardanger that have developed from it. An aside: I’ve been bemused by some of the more bizarre examples of ‘Hardanger-Work’ I’ve seen in pattern books from the early years of the 20th century. Norwegian Drawn Work, for example, has some very strange dresses and shirts. 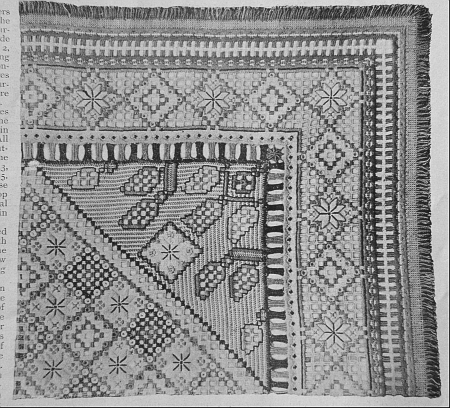 The picture below is a table centre in ‘Hardanger work’ from Fancy Needlework Illustrated in 1907 (in my own collection). It’s worked in five shades of yellow pearl cotton, four greens, three blues, black and cream. Quite a long way from the neat, crisp white-on-white bands of the original style, isn’t it? I wouldn’t call it an improvement! Coming back to the book, the next section features a range of attractive projects, from small pieces (a box-lid, a bookmark, a biscornu pincushion) through to a most romantic blouse, a crisp table-runner and my favourite: a traditional apron with a broad band of lacy stitchery. The charts and patterns for these projects are on three large, folded sheets of paper in a pocket at the back of the book. (It’s good quality paper, but I would suggest taking photocopies of any charts that you need to work from, to save wear and tear on the originals.) There are not just charts, oh no: there are also diagrams showing the exact order of working the cutwork areas, step by step. As I said before, this book is thorough. The final section of Early Style Hardanger is the largest section by far: the stitches and techniques. Every stitch is clearly illustrated and carefully explained, with all the step-by-step diagrams that you could wish for. Yvette also shows how to check for counting errors and how to correct mistakes such as cutting the wrong thread as well as how to best avoid them. Wherever there’s the slightest difference between left-handed and right-handed instructions, both are given. (Each set is shown in full, so there is no need to flip between pages. The order-of-working diagrams on the pattern sheets are also shown for both left- and right-handed stitchers.) I’ve been coping with right-handed instructions for fifty years. It seems a remarkable self-indulgence to have everything shown ‘my way’ too. For me, the historical and the technical parts of the book are the most interesting. The projects are all excellent, and inspirational eye-candy, but I get more fun from developing my own patterns than from exactly copying a set piece. Most of the projects are worked on 36-count linen, which is quite widely available in the UK, using linen thread – which is not so easy to find over here. Yvette does stock suitable linen threads (and the other necessary materials) in her online shop. Because of the cost of postage from Sydney, Australia, I went looking for a UK stockist. I’m very pleased to have found Jo Firth Lacemaking and Needlecraft Supplies. Jo stocks Bockens Knyppelgarn Swedish linen thread, in many sizes. She has lots more threads as well, and carries all sorts of things that are not very easy to come by elsewhere. If you like fine threads for embroidery or if you make any kind of lace , it’s well worth bookmarking this shop. I wasn’t expecting to see much advantage in using linen thread, being usually happy with cotton, but now I can see why Yvette recommends it. Not only are the specified weights exactly right for 36-count fabric – the 35/2 is a little thicker than Cotton 12 and the 50/2 a little thinner – the linen takes a sharp crease when you squeeze it with your fingers, which makes the stitches stay in place on the fabric without springing up. I am converted! One unexpected result of reading Early Style Hardanger is that I’ve found myself thinking again about why I stitch and what I get out of it. I definitely do it for the pleasure of doing it (yes, even when I am unpicking half a day’s work and feeling like throwing the piece out of the window in frustration). Finished results are a pleasant side-effect of stitching but are not my main focus. And half the fun of stitching comes from figuring things out, problem-solving, finding ways to adapt stitches to my own left-handed working and exploring combinations of fabric, thread and style, just to see what happens. In some ways, Yvette Stanton’s book is a bit too thorough for me: I’ve rarely seen instructions that require so little ‘translation’ and guesswork. But the book will lead to more enjoyable puzzlement when I use it as a jumping-off point for further experiment and explorations in due course. Meanwhile I am trying to be disciplined (for a change) and intend to perfect my Hardanger stitches by actually following the instructions! This entry was posted on July 2, 2016 at 3:40 pm and is filed under books, Embroidery, hardanger, Needlework, whitework with tags book, Early Style Hardanger, Embroidery, Norwegian, review, stitchery, whitework, Yvette Stanton. You can follow any responses to this entry through the RSS 2.0 feed. You can leave a response, or trackback from your own site. 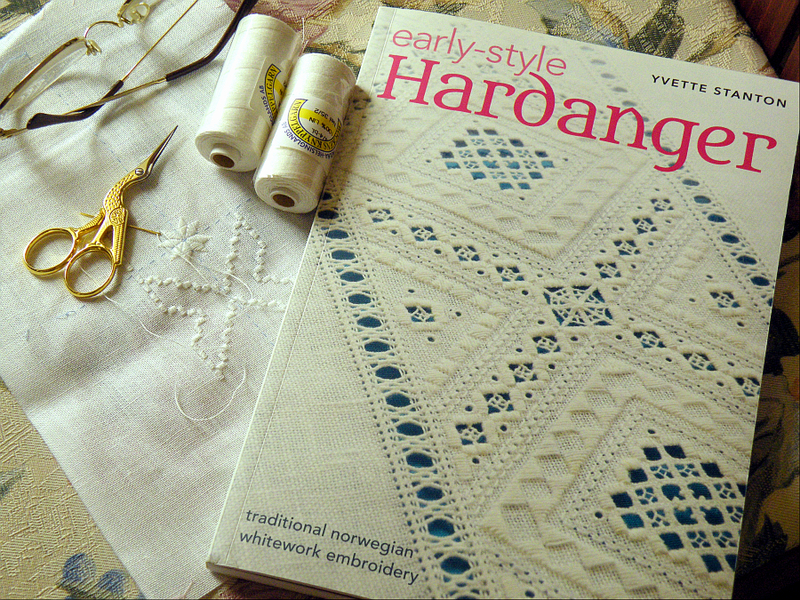 If you like your Hardanger fine and fiddly, I think you’ll love this book. And it’s always a pleasure to be able to give a shout out for a good needlecraft stockist as opposed to one of the big box suppliers. I think what Yvette has done is move your pleasurable puzzling to a different stage of the project! I’m very tempted by the idea of an embroidered blouse, but using what for time, at present…? I think you’re right, Rachel. it’s given me the chance to explore whole new areas of confusion! You’re welcome, Yvette. Fortunately there are a few styles and techniques that you haven’t got around to explaining yet, so I can still puzzle over fuzzy photos and bizarre instructions…. Yvette wrote the most excellent “stitching for left handed embroiderers” – which includes plaited braid stitch, and understands that some of us learn visually, some of us learn from text. I’m really glad to hear that she has a new one out. I think left-handers do have an advantage when it comes to writing instructions and making clear diagrams. We’re used to struggling with bad examples in books, so we know what’s really needed in order to understand the process. But it does come with a tendency to dot every ‘i’ and cross every ‘t’. I suppose that we wouldn’t bother trying to learn complex embroidery if we didn’t have that slightly obsessive attitude to making mechanical sense of examples that we can’t just copy blindly. We are natural problem solvers! Jo Firth’s shop is a little goldmine, isn’t it? I just discovered your blog. Your work is lovely! I found the blog by searching “Swedish cut work”. I’m a quilter, but I appreciate lovely embroidery. Months ago I bought a table topper in a charity shop in Pennsylvania. I had an idea it was Swedish cutwork, hence the Web search. Now that I see your work, I’m wondering if it’s actually Norwegian Hardanger. If I send you a picture, could you tell me? I’m not an expert on Scandinavian embroidery, but I would very much like to see a picture of your ‘Swedish cutwork’. The ‘Hardanger’ type of cutwork was also worked in Sweden and other countries, as well as other, slightly different, styles of whitework. So unless you’ve got definite ‘provenance’ it isn’t easy to tell for certain where a piece comes from. Thank you for your kind comments, Gloria. I love to know when people enjoy the blog. Just wanted to say thank you for the UK thread recommendation. I don’t mind having to order threads from overseas, but it’s always nice to support businesses closer to home – that and less time waiting (not so patiently) for supplies to arrive! Welcome to the blog, Amanda. I rather like the happy anticipation of a parcel on a long journey to me, but I do try to source tools and materials locally or from small UK businesses through the Internet when I can. Not just more convenient and a saving in ‘textile miles’, the small businesses generally turn out to be run by knowledgeable and helpful enthusiasts, more willing to carry unusual items than the big sites.